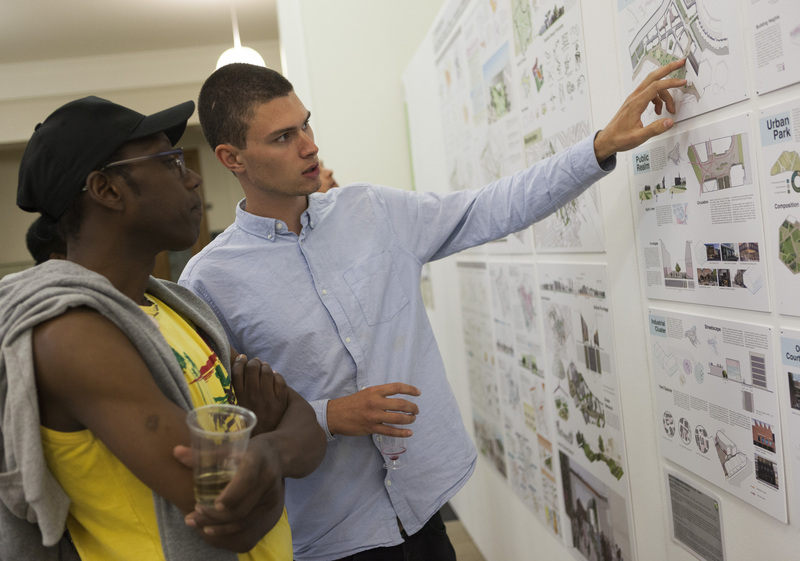 On 18 May, University College London’s Bartlett School of Planning displayed eight alternative masterplans for the Earl’s Court and West Kensington Opportunity Area. 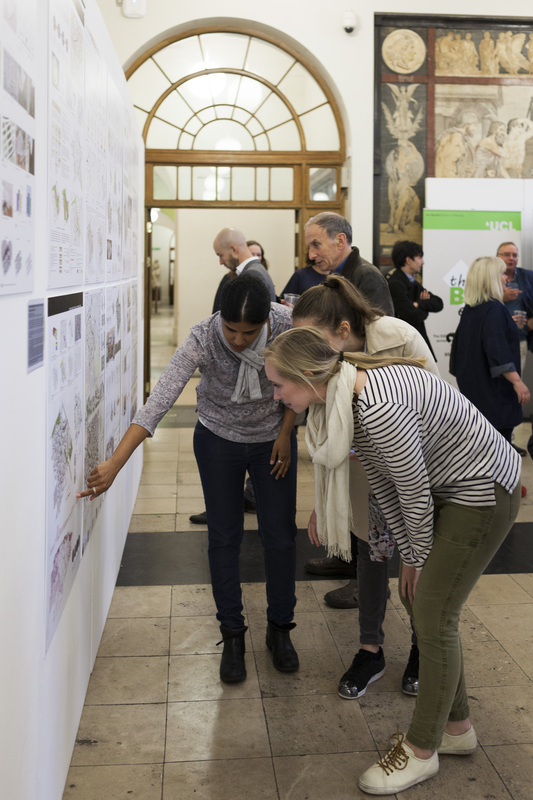 Each masterplan, prepared by groups of up to four students from the third year and master degree courses, led by tutor Dr Juliana Martins, presented ideas for developing the area very different to the masterplan created by Sir Terry Farrell on behalf of Capco. 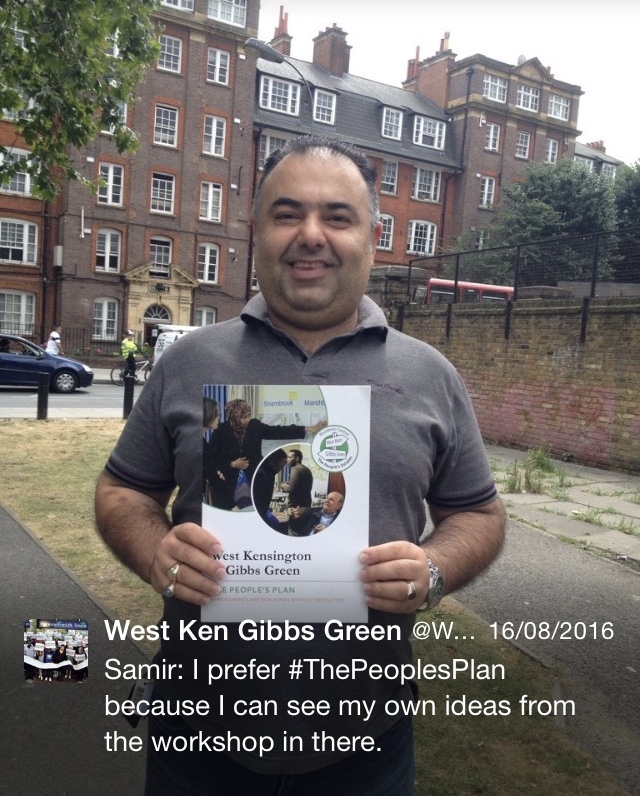 Unlike that plan, most of these plans incorporated all or part of the West Kensington and Gibbs Green estates and re-introduced a major cultural and exhibition facility directly accessible from Earl’s Court station. Far from being solely based on demolition and luxury flats, some of the plans preserved the historic railway sheds and established a centre for transport engineering excellence, building on the legacy of the Lillie Bridge Rail Underground Maintenance Depot and the Transport for London Training facility at Ashfield House. 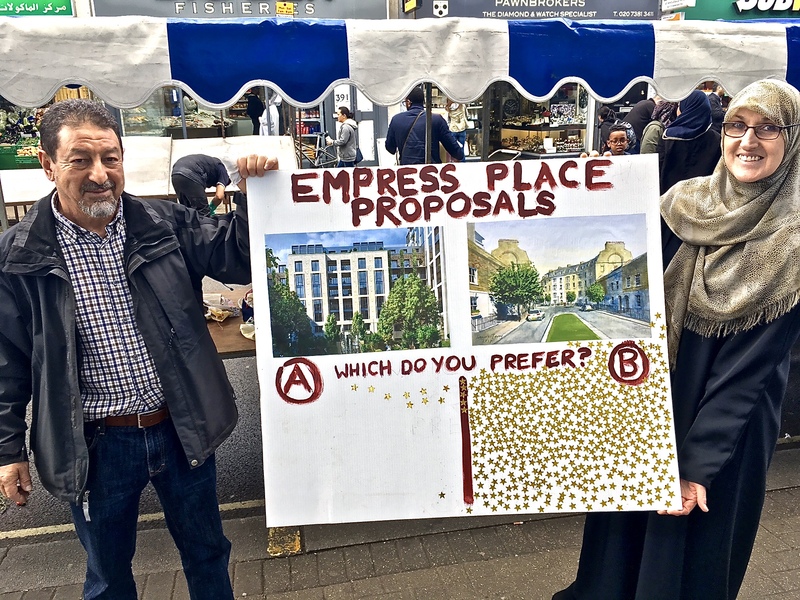 Both the London Mayor, Sadiq Khan, and developer Capco have said they want to review the masterplan for the wider area, amid common agreement that the consented plan for Earl’s Court is not fit for purpose. These fascinating and imaginative contributions show that masterplanning is not the preserve of celebrity architects or self-interested developers. There is an alternative, and there is a better way. 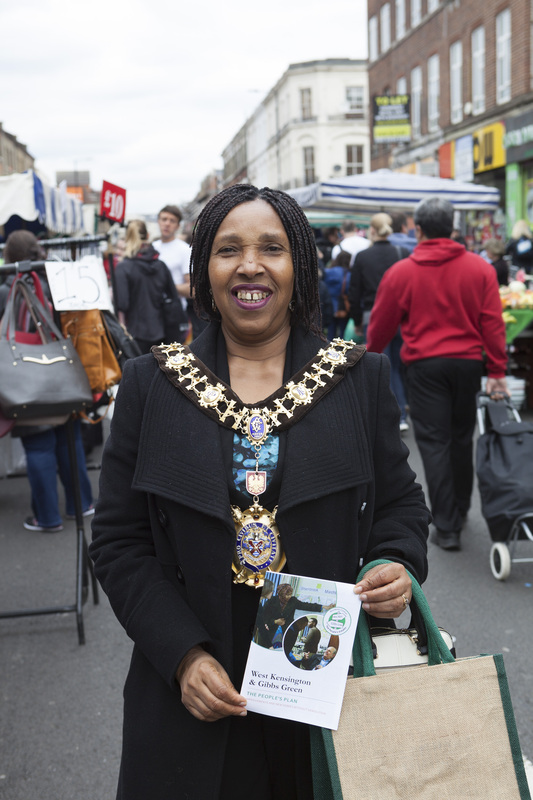 On Saturday 29 April, North End Road was closed all day for the Council’s Spring Market. 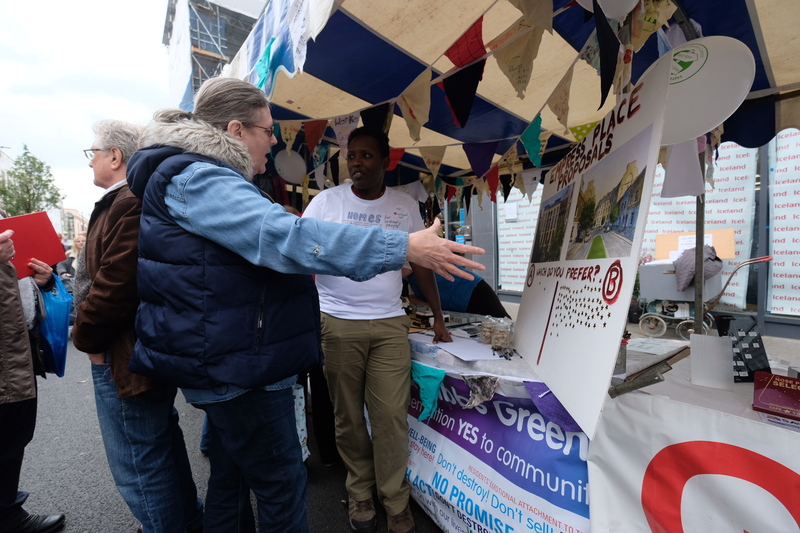 The West Kensington & Gibbs Green community had a stall displaying the People’s Plan, our alternative for making improvements and building additional homes without demolition. 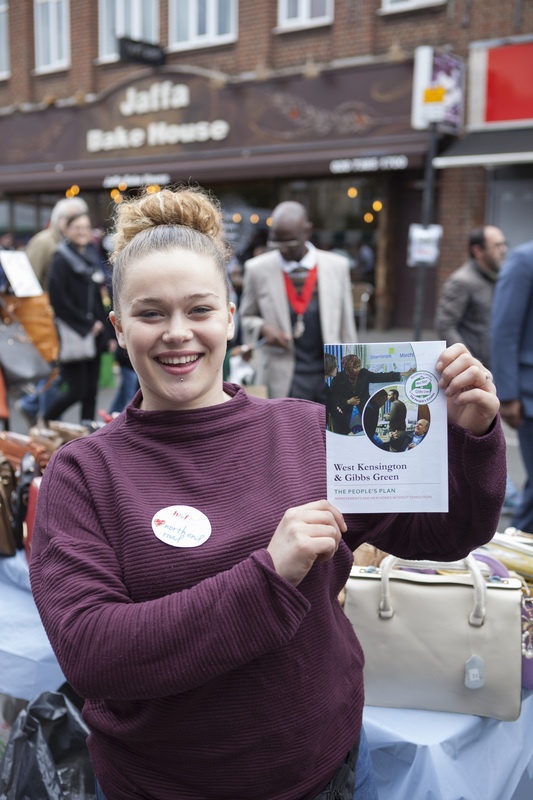 Throughout the day, hundreds of local people visited us to learn more about our campaign and to support our alternative vision. After lugging the People’s Plan model to the market, the People’s Pram enjoys a well earned rest! 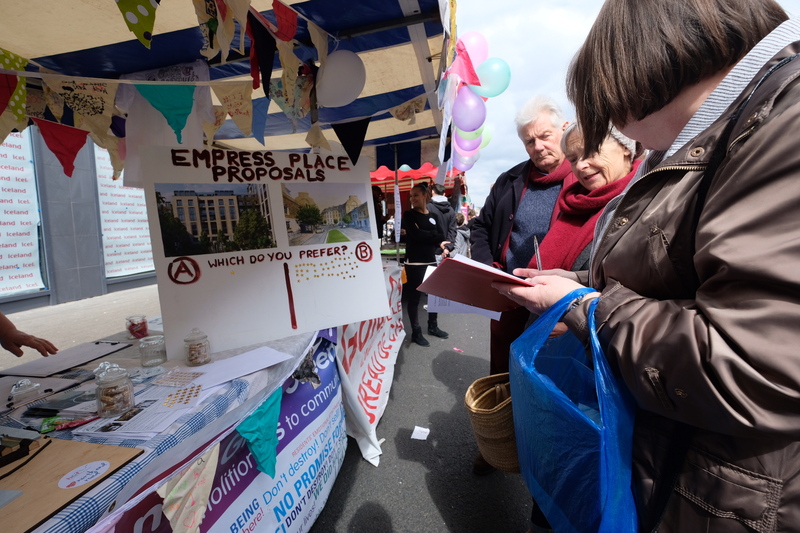 A daft marketing gimmick went spectacularly wrong on Saturday when residents used Capco’s own ‘community engagement’ event to expose the harm its plans are causing to local people and their neighbourhood. 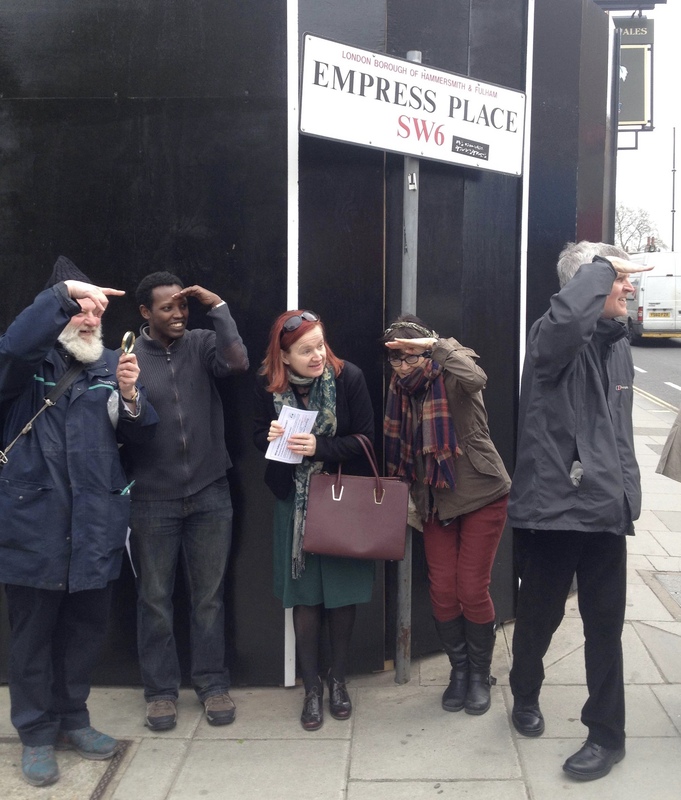 As part of Capco’s offensive to con people out of their homes, which has included summonses to decorate “luxury biscuits”, residents were invited to the developer’s Earls Court Project Rooms to “learn more about the Earls Court development”. 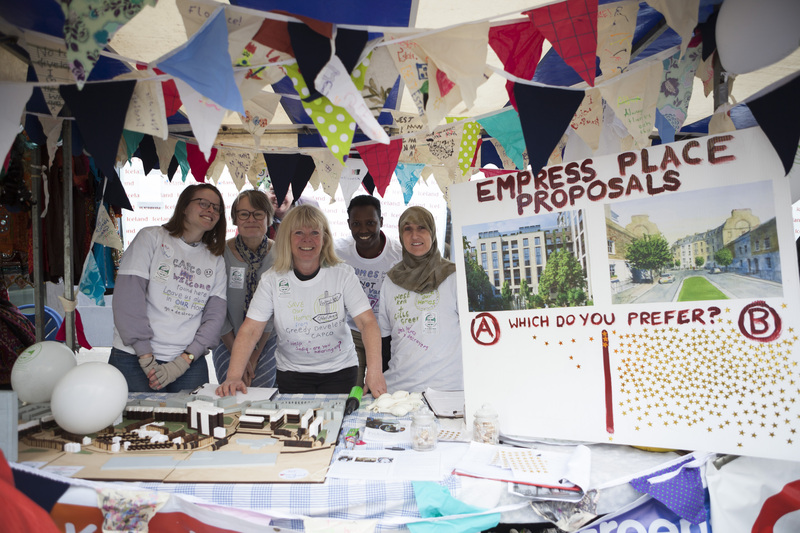 The developer is keen to show off its plans to destroy the attractive Victorian houses in Empress Place along with the historic Project Rooms themselves. The enticement on this occasion was nothing less than the opportunity to “create your own personalised organic tote bag”. Faced with such a tantalising prospect, local residents participated enthusiastically. The result? 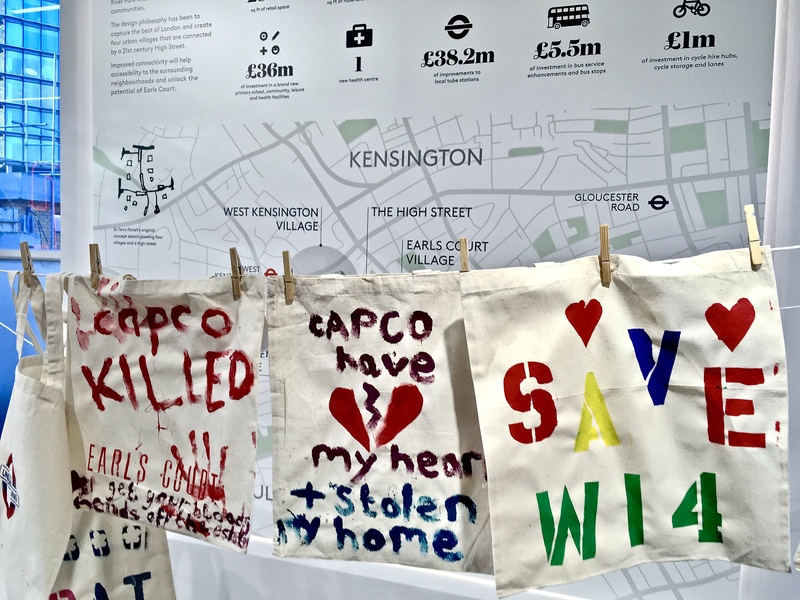 Cotton bags decorated with “Capco has broken my heart and stolen my home”, “Capco KILLED Earls Court: get your bloody hands off the estates” and “Save W14” hung prominently against the developer’s propaganda backdrop in Capco’s very own Project Rooms. 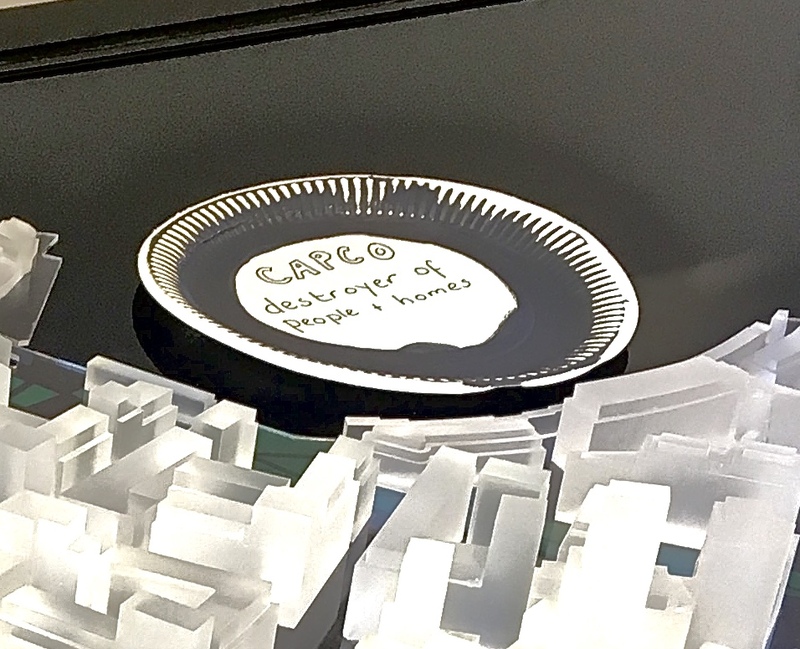 Meanwhile, Capco exposed further how out of touch it is with its latest edition of ‘The View’, though the only view residents have is of the pile of rubble left by Capco’s destruction of the much-loved exhibition centres. Capco’s Managing Director, Gary Yardley, claimed that its portakabin show homes space “sets the gold standard for engaging with residents”. But gold is not enough. As Capco went on to proclaim: “The New Homes Space not only sets the new gold standard for resident engagement but also uses the latest gaming technologies to create realistic walk-throughs of the new homes.” Who’d have imagined that a developer would try and dupe residents into giving up their homes through a computer game? In July, we reported that Capco’s sales rate at Lillie Square was slightly less than one per week. 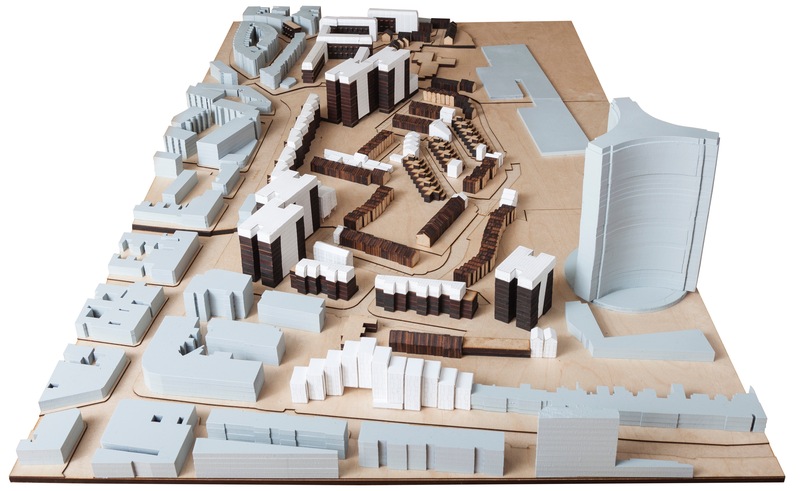 This, we calculated, meant it would take Capco 35 years to sell the remaining 357 Lillie Square homes and the 1,314 homes to be built on the site of the former exhibition centres. And that was before any homes are built on the estates land or the rail depot. In September, in an article that appeared in the Financial Times, a property analyst suggested it could take a century to achieve all the sales that are planned across the whole site. According to Capco’s Trading Update for the period 1 July 2016 to 28 November 2016, the total number of apartments reserved or exchanged in Phase 2 of Lillie Square has reached 50. This is an increase over a 21-week period of just nine flats from the 41 that were reported as reserved or exchanged in the Interim Results for the six months ended 30 June 2016. This means Capco’s sales rate has halved to less than one per fortnight, doubling our estimate for how long it would take to sell the part of the development with detailed planning consent to 70 years and across the whole site to 200 years, assuming this rate remains constant. So, it was not surprising when Capco suggested in another Financial Times article, which appeared in October, that it intends to switch between 20 and 25 per cent of the homes for sale to homes for rent. 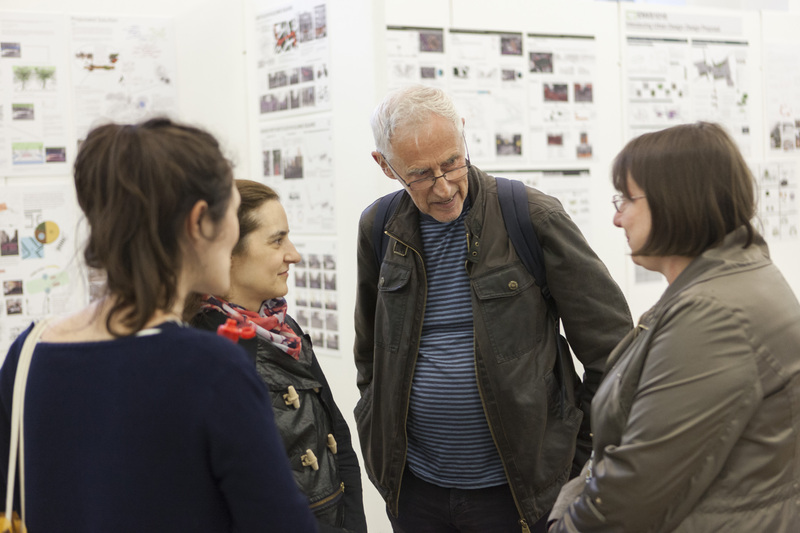 Capco Director, Gary Yardley, said: “We want to create something people can be proud of in 100 years”. But, at the rate Capco is going, even with converting a quarter of the homes from sale to rent, in 100 years time the job won’t be half done. That’s because, as the developer admitted in the FT article, and in an article published in the Daily Telegraph in July, it wants to up the total number of homes to be built across the whole site from 7,500 to 10,000. “This Council notes the announcement that CapCo is considering a significant change of housing mix and a significant increase in the density of its Earl’s Court redevelopment, which would impact on the wider masterplan for the area as reflected in the Earl’s Court and West Kensington Opportunity Area Joint Supplementary Planning Document adopted by this Council in March 2012. The Council also notes the very high level of public interest in the Earl’s Court development, as one of London’s major regeneration areas. Hey Capco! What do you say to that? 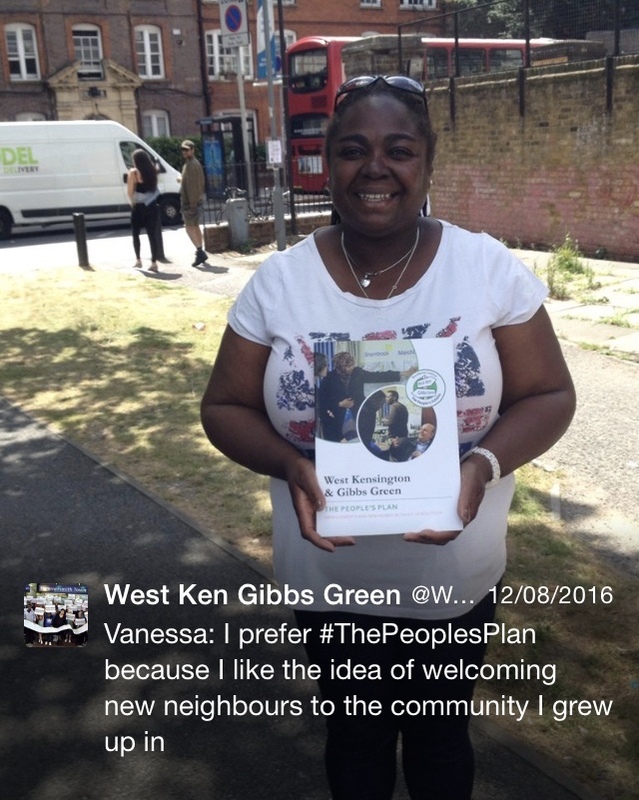 94 people, of whom 78 were residents, attended the Annual General Meetings for the West Kensington estate TRA, the Gibbs Green & Dieppe Close TRA and West Ken Gibbs Green Community Homes (WKGGCH). 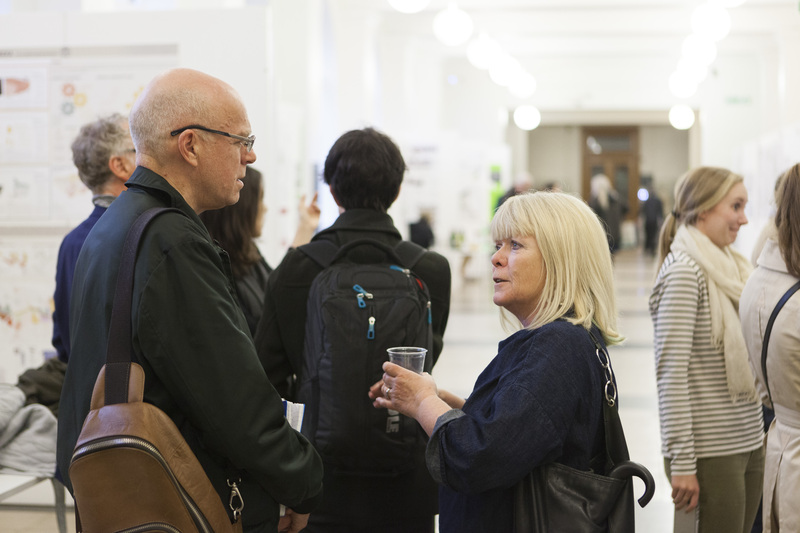 The meetings were held on 4 October 2016 in the Gibbs Green Hall. The TRA AGMs received reports from their respective Chairs, Sally Taylor and Diana Belshaw, approved the accounts and elected committee members. 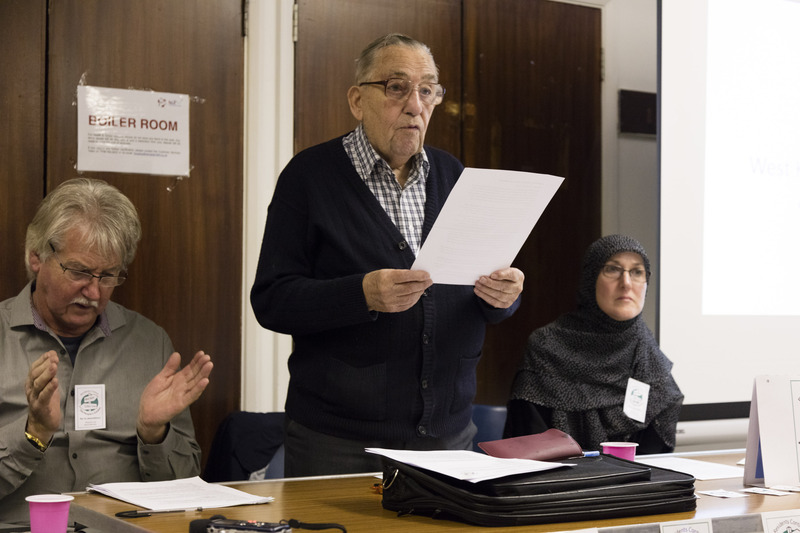 The WKGGCH meeting followed straight on, when residents of both estates came together under the chairmanship of Keith Drew. 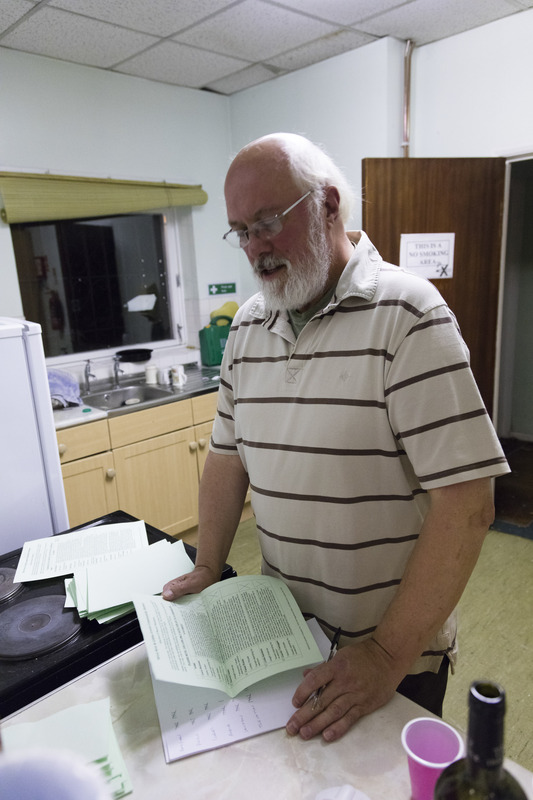 Treasurer Charlie Treloggan took the meeting through the accounts, highlighting the expenditure on producing and publicising the People’s Plan. 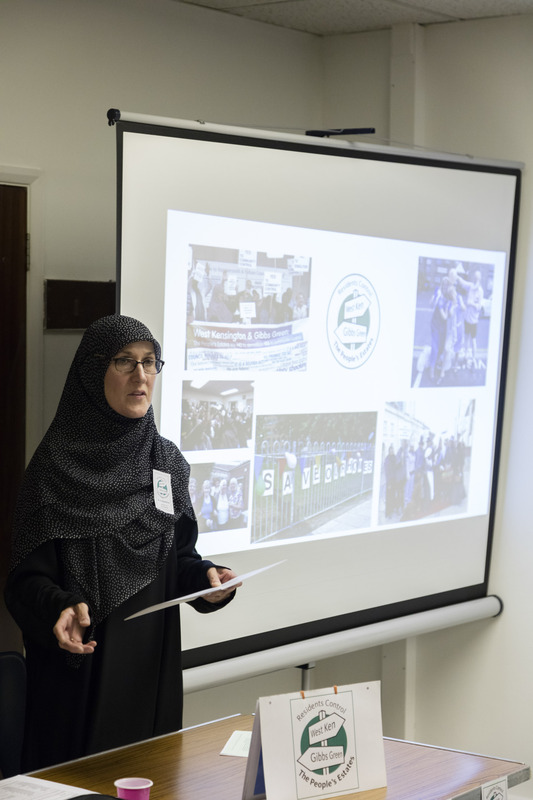 WKGGCH Company Secretary, Linda Sanders, gave the annual report on the activities of the organisation. 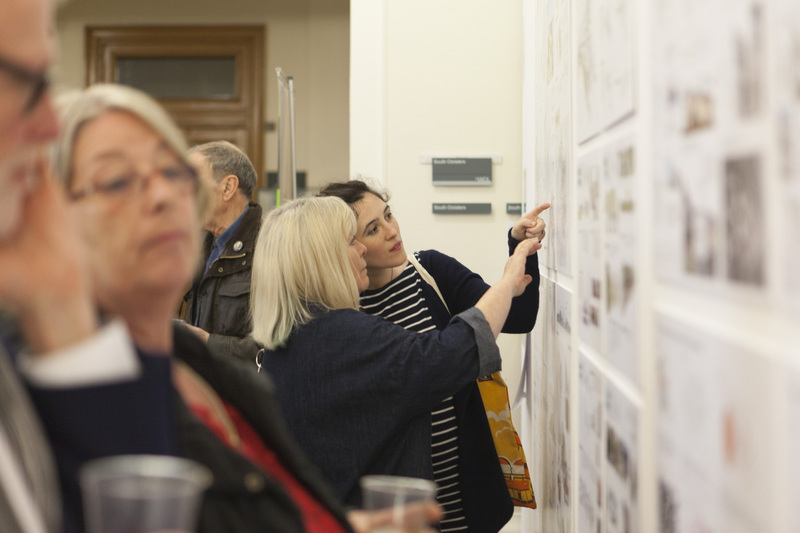 Firstly, she displayed a slide showing the Land Registry title proving that despite the contract between the Council and developer Capco, the estates land is still owned by the Council. 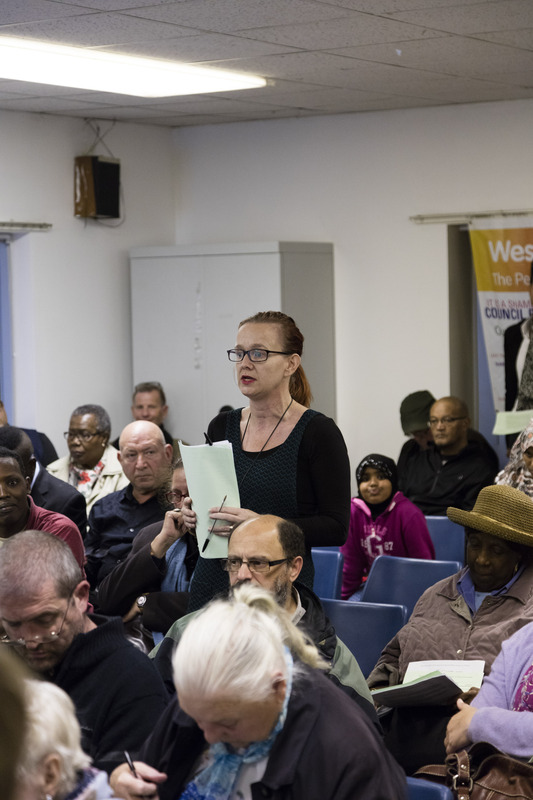 Linda went on to remind the meeting about the participation of over 100 residents in the production of the People’s Plan and its positive reception on the estates. 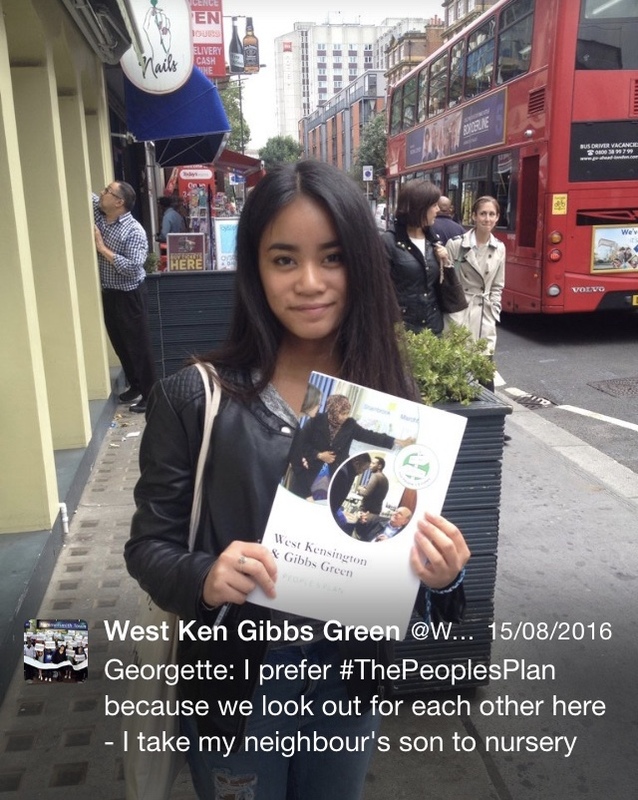 She further reported that following the collection of over 7,600 signatures for an online petition, the then candidate, now Mayor Sadiq Khan, had agreed to review the Earl’s Court masterplan as he had serious reservations about the overall direction the scheme is taking. Finally she reported on the submissions we have made to the Government in support of our Right to Transfer proposal, the lack of any significant progress made with the demolition scheme, and the one third reduction in Capco’s share price along with its difficulties selling the new homes it is building in Lillie Square. 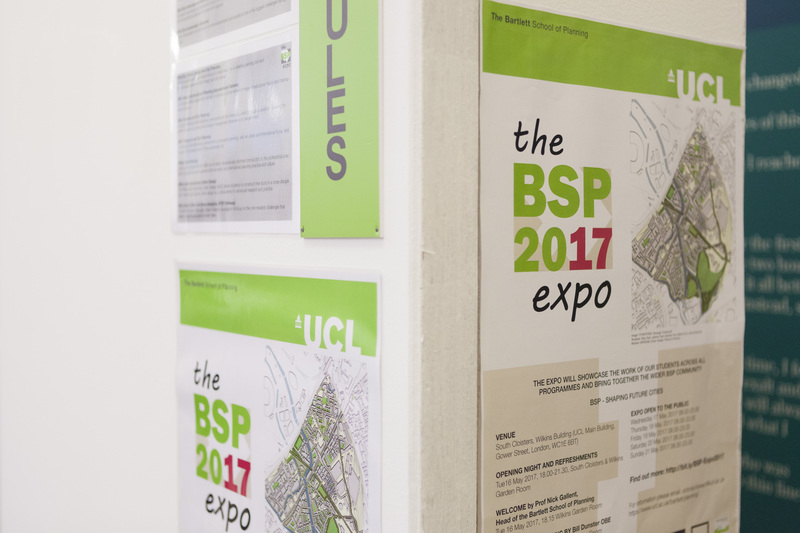 Board Member and Chair of West Kensington TRA, Sally Taylor, summarised the People’s Plan, pointing to the model on display in the hall. The Plan is proving to be a popular alternative for delivering improvements and additional homes without demolition. 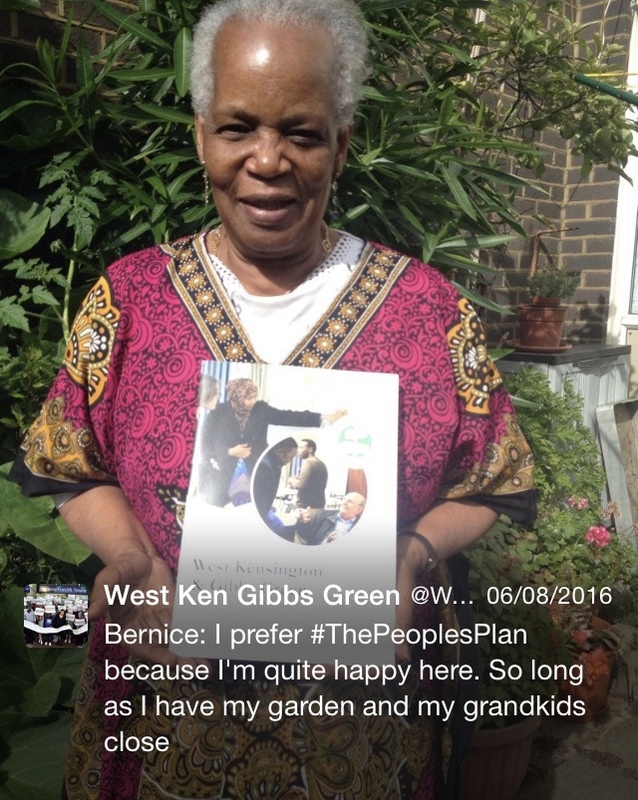 Donna Isaac, one of the six candidates for five places on the WKGGCH Board explained that she had been living on the estates as a temporary licensee for over a year and that she was determined to contribute to the campaign to save the estates. 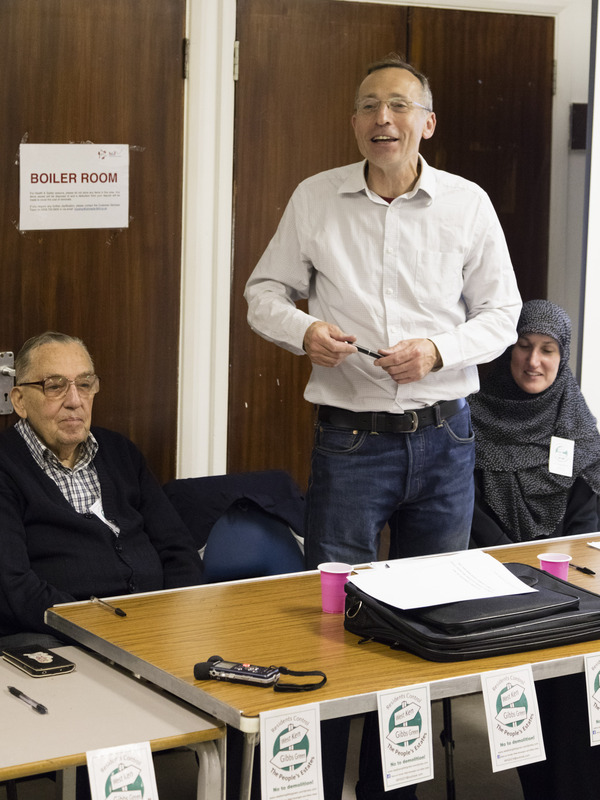 Faisal Roble, another candidate, said that he had helped a lot with the People’s Plan and wanted to help stop the demolition because this is his home and he is a passionate believer in social housing. Co-opted Board Member Kevin Veness counted the votes to elect the Board Members. 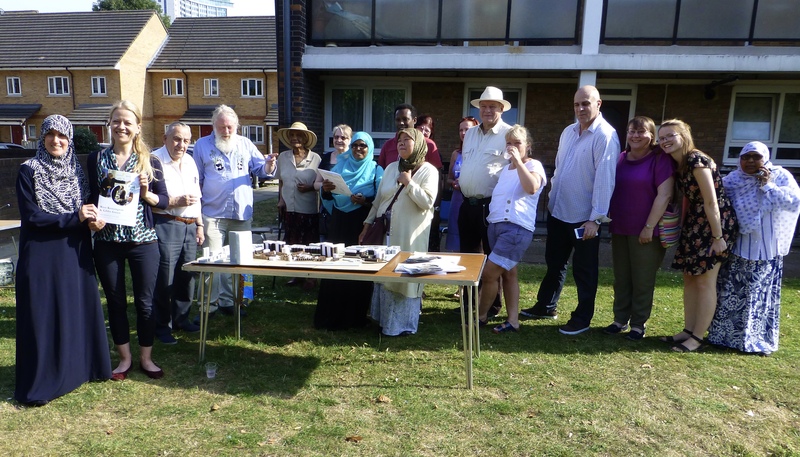 Local MP Andy Slaughter, who has steadfastly supported residents throughout our campaign, said it was thanks to the community’s efforts that the estates were still standing. 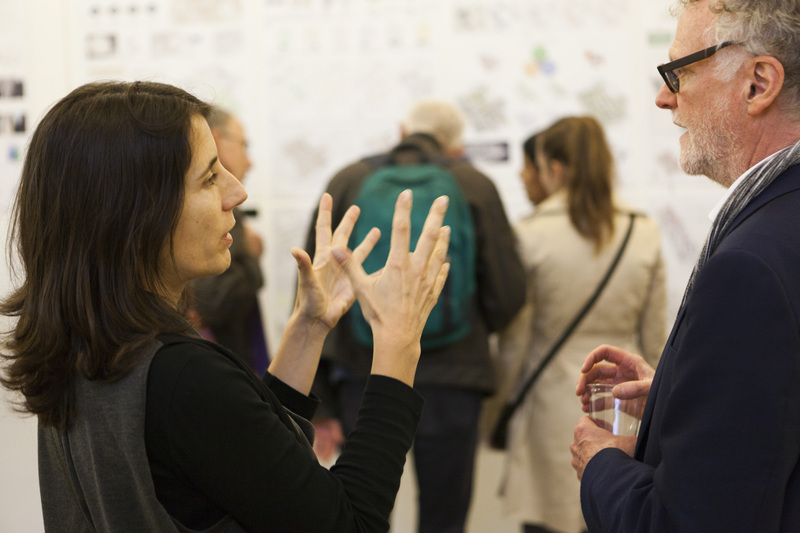 In his view, the masterplan is dead and the plans will have to be redrawn. The Chair thanked residents for attending. The meeting closed and was followed by refreshments. 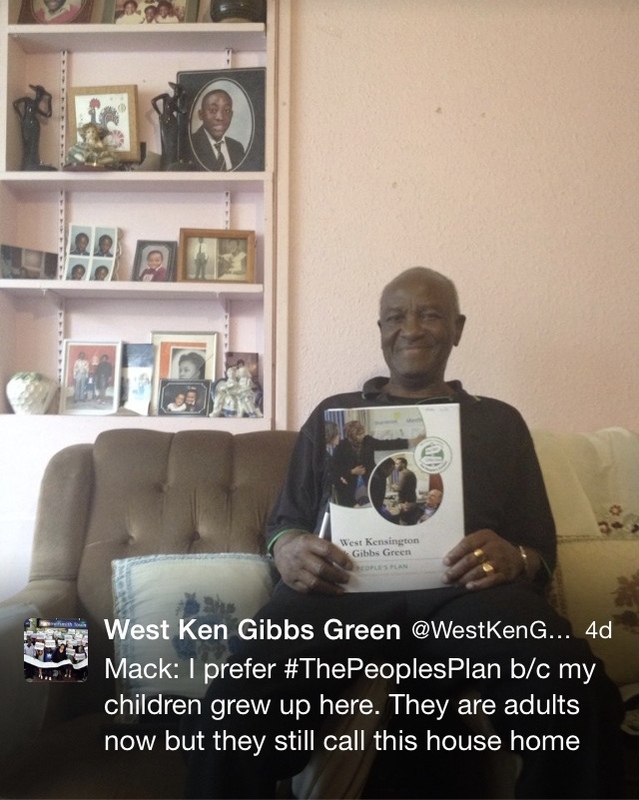 We are proud to present the People’s Plan for improvements and new homes without demolition. 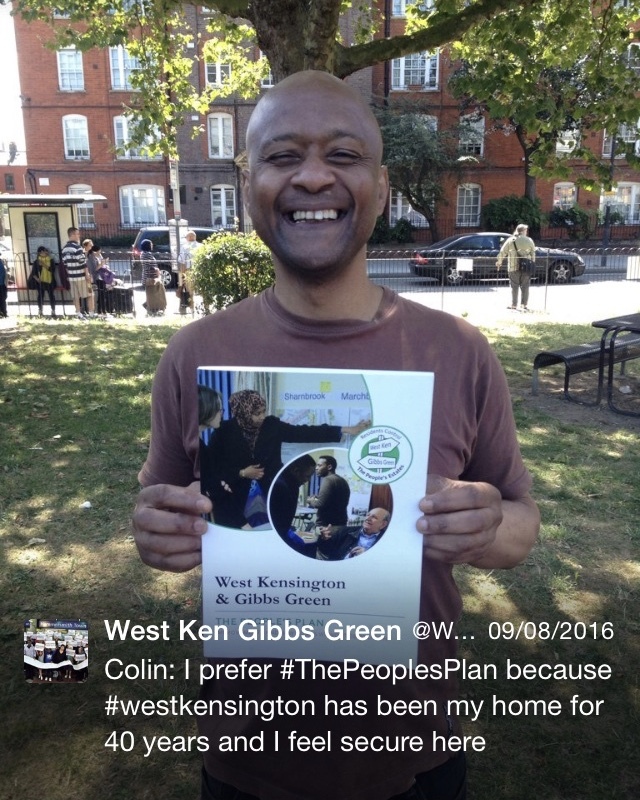 These are still early proposals but they demonstrate that demolition of the West Kensington and Gibbs Green estates (which a majority of residents have consistently opposed) is simply not necessary. So far over one hundred of us have come together to identify how we want to develop our estates and improve our homes in the future. We have enlisted professionally accredited architects, valuers and quantity surveyors to show that what we want is possible. 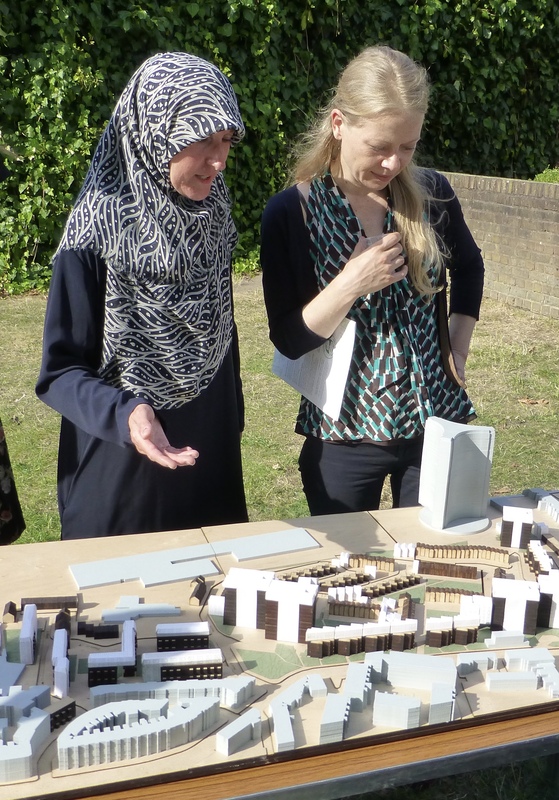 The project has been funded by the Nationwide Foundation as part of its support for initiatives to develop alternative models for creating new affordable housing. Here is a summary of the People’s Plan. And here is the architects report. There are currently 760 homes on the estates. 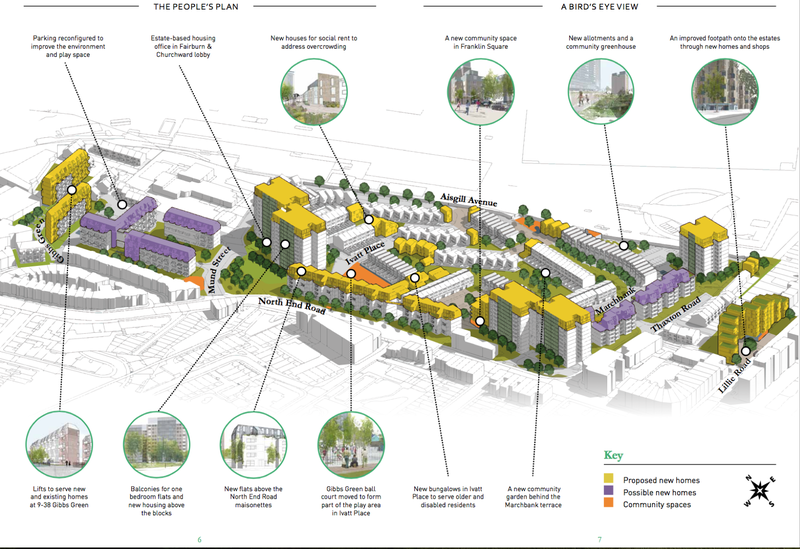 We are proposing to build 250 new homes where we have identified space. 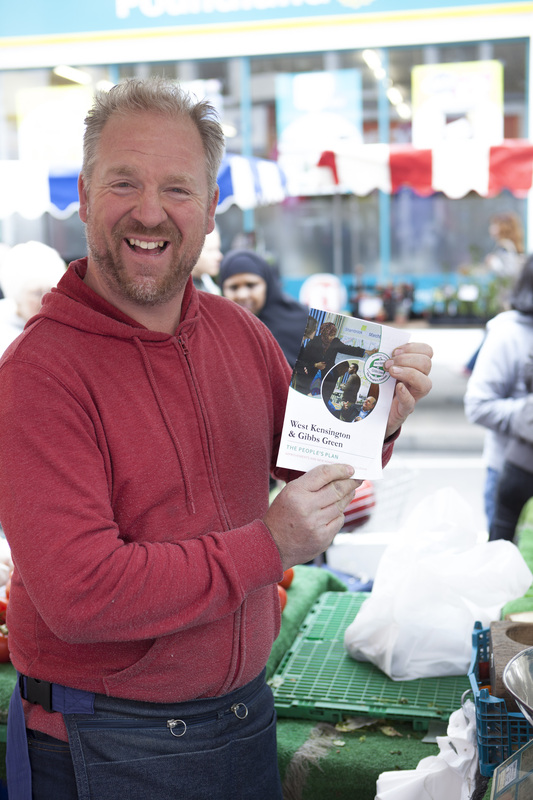 By selling 180 of these, we could generate £50 million to help pay for the improvements and 70 new homes for social rent. Most of the new homes for social rent would be family size houses, but some would be bungalows for elderly and disabled residents. These new homes would help address overcrowding on the estates and suit tenants looking to down-size. Most of the homes for sale would be built in new storeys above, and extensions to, existing blocks of housing. Proposed improvements include: better insulation and ventilation; upgraded bins and refuse systems; glazed balconies to add space to the one bedroom flats in the tower blocks; upgraded communal areas; better control of green space; better security; enhanced landscaping with a new community garden and allotments. 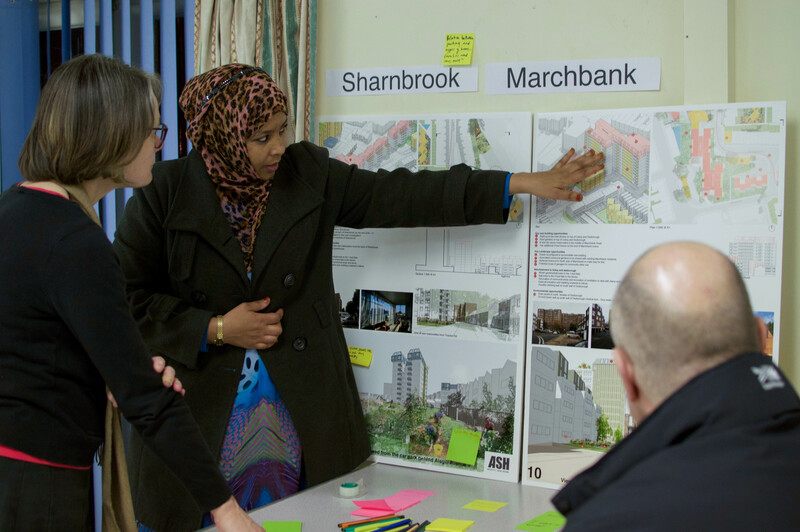 In addition, we are proposing an estate-based housing office and a new community centre for both estates. 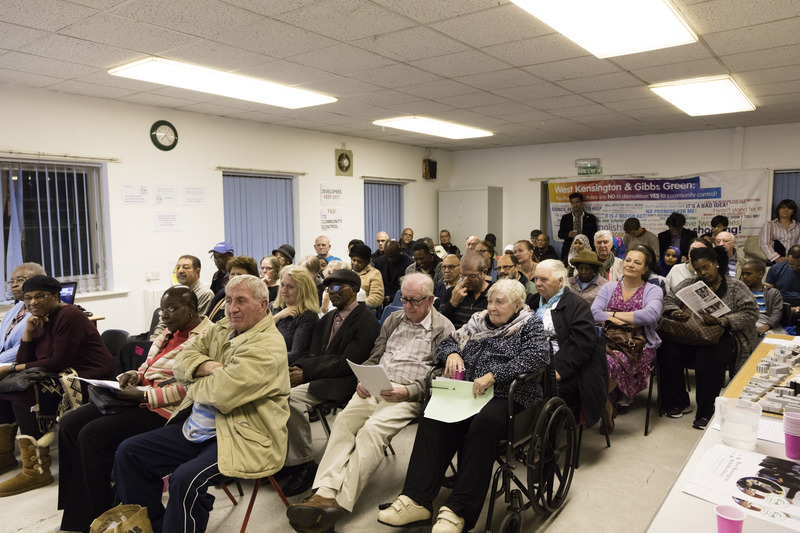 And, we would re-instate the concierge scheme for Fairburn and Churchward Houses. 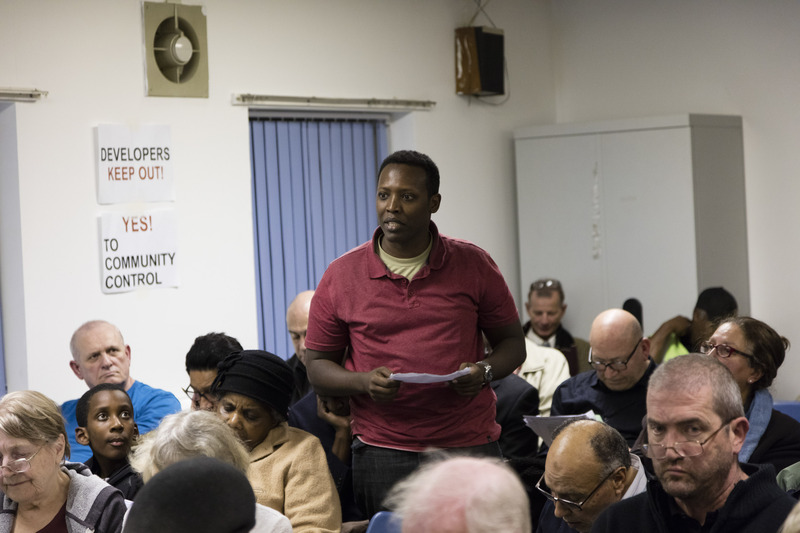 We have been advised that our proposals could be completed within five years of obtaining the necessary permissions – far less time than it would take for the developer to demolish and redevelop the estates. 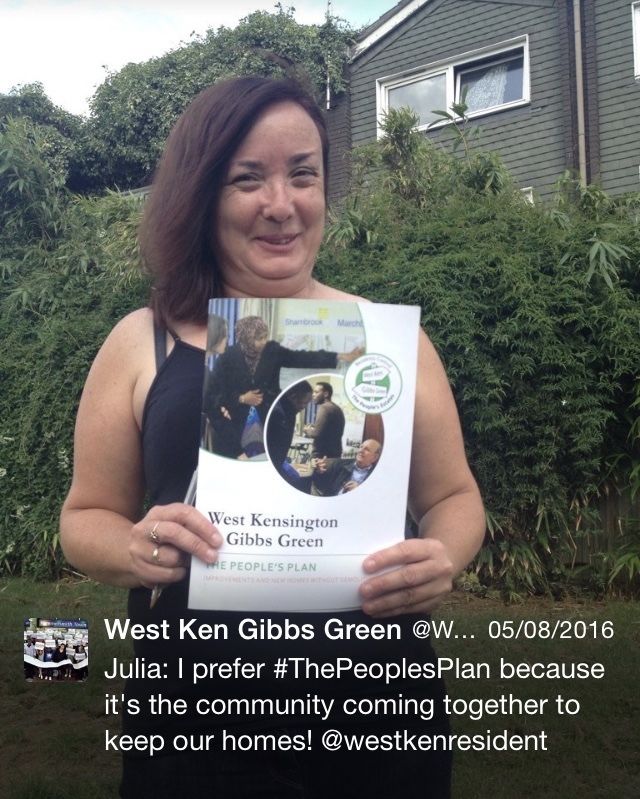 The People’s Plan could be implemented either by the residents through West Ken Gibbs Green Community Homes, if we succeed in taking ownership of the estates through the Right to Transfer, or by working with Hammersmith & Fulham Council and the Mayor for London should the developer-led scheme fail. These are still early proposals: please get in touch and tell us what you think! 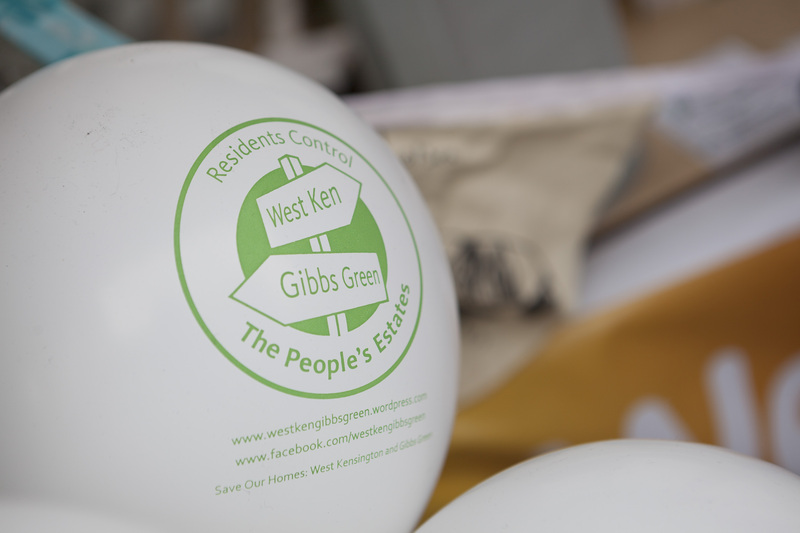 You can find us on Twitter @WestKenGibbsGr #ThePeoplesPlan or on Facebook at www.facebook.com/westkengibbsgreen or by joining the Facebook group ‘Save our Homes: West Kensington and Gibbs Green’. 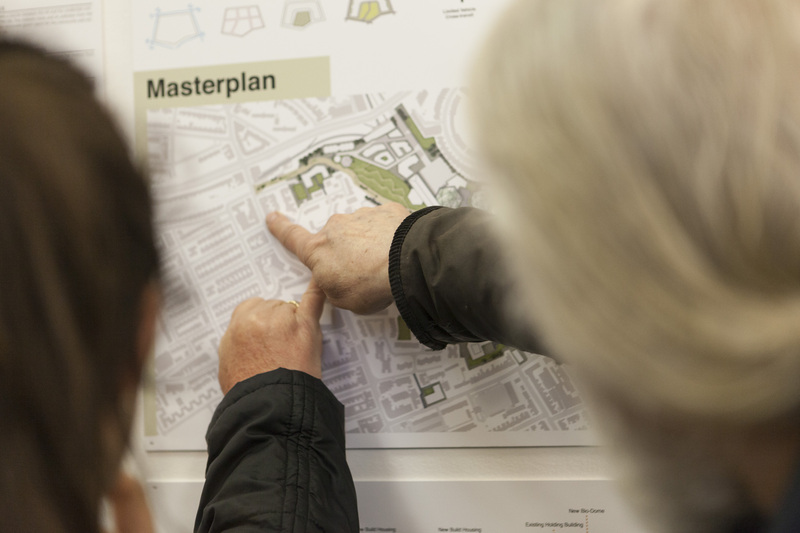 If you live on or near the estates, please get in touch to find out about drop-in sessions in July and August (when the model of the proposals will be on display) or to arrange a visit to explain the plans. Alternatively, a copy of the feedback form can be downloaded by clicking here. You can contact our Housing Organiser Zoe on 07754 701 636 or email zoe.wkggch@gmail.com. In June, Deutsche Bank’s Market Research department published a report on Capco that recommended shares should be sold in light of the Bank’s prediction their price would drop by 23% to 260 pence. This was based on a forecast that residential property prices face a 20% decline driven largely by a collapse in the buy-to-let market especially affecting prime central London new-build homes. Deutsche Bank singles out Capco from all the other developers since the nature of its development pipeline makes it particularly vulnerable to the “impending shock to the residential market”. The report predicts that the fall in house prices will drive down the valuation of Capco’s Earl’s Court land by 65%. 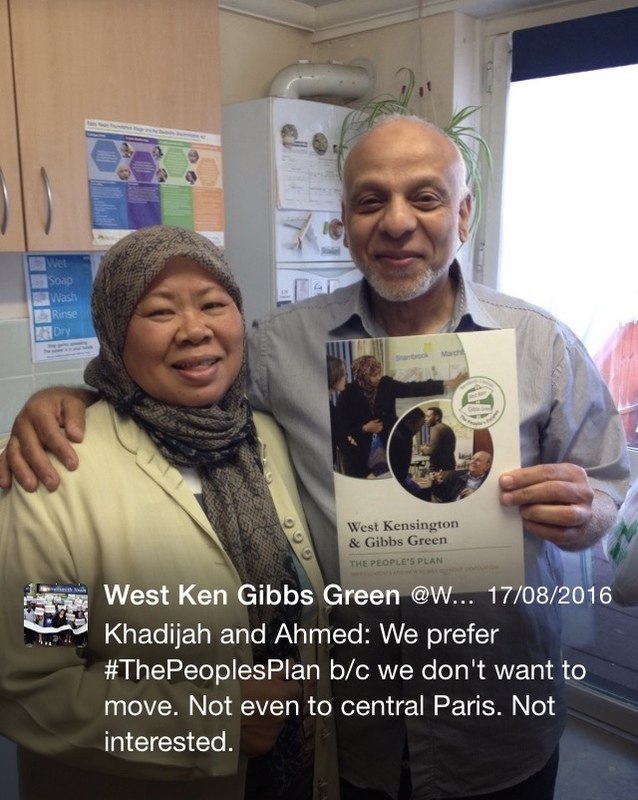 Deutsche Bank attaches no value at all to the West Kensington & Gibbs Green estates because it says their redevelopment is unlikely to be profitable for Capco given the amount of replacement and affordable housing involved. 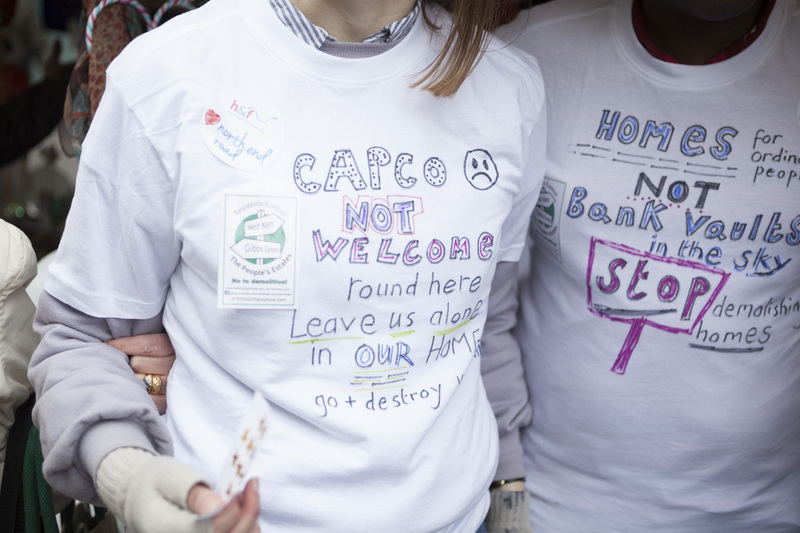 And because Capco does not have enough money to build the new homes, the bank expects the company will be bought out within a couple of years. 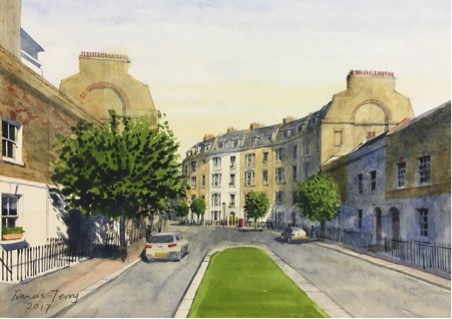 Although the Bank anticipates that Capco will obtain a fresh planning permission to build even more homes, it does not think that will help much to improve the developer’s position. Ironically, Deutsche Bank felt that Capco’s ownership of Covent Garden was a stabilising factor for the company, albeit this part of the business was unlikely to deliver growth. In fact, this week several commercial property funds have had to suspend dealings in the face huge withdrawals. This has put even more pressure on Capco’s share price, which, following the referendum vote to leave the European Union, was already on a downward trend. On the day of the referendum, Capco’s share price closed at 362.50 pence. By 8 July their price closed at 274.40 having reached a low that day of 258.40. 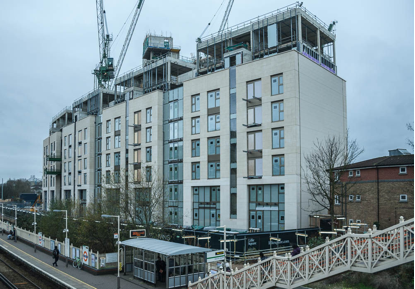 In March and April this year, homes in the Company’s Lillie Square development were being reserved or exchanged at the rate of slightly less than one per week. 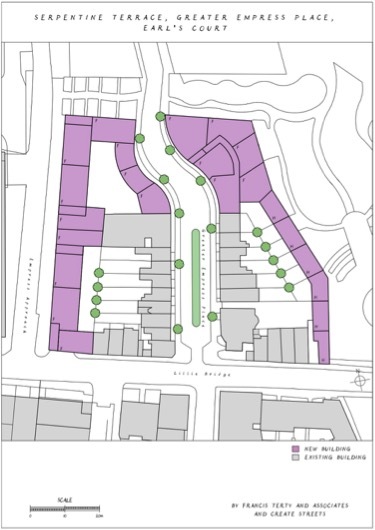 At that rate, it would take Capco 35 years to dispose of the remaining 357 Lillie Square homes and the 1,314 homes to be built on the site of the former exhibition centres. And that is before any homes are built on the estates land or the rail depot. Can even this rate of disposal be maintained in the current market? The imminent decline in property prices coupled with the Brexit vote spell a long period of uncertainty that is likely to delay, if not put an end to, Capco’s redevelopment plans for the West Kensington and Gibbs Green estates. Under these circumstances, it seems most unlikely the redevelopment of the estates could happen. 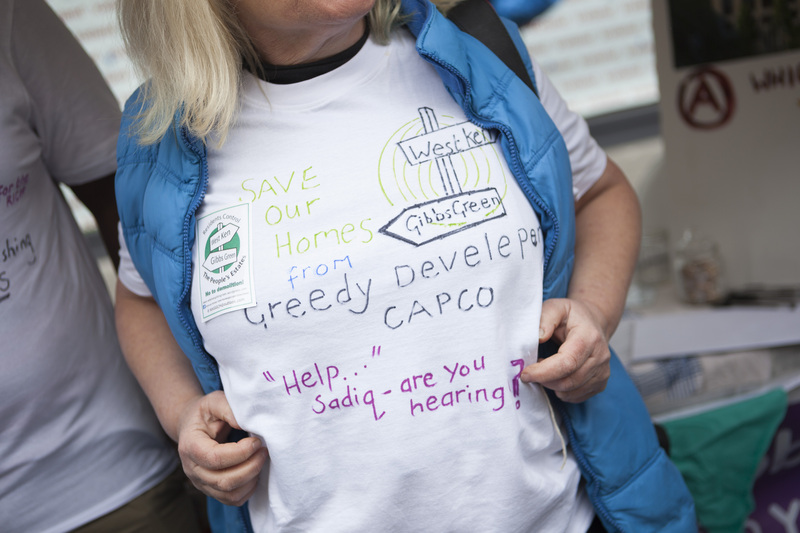 Capco has not even begun to build the first phase of replacement homes for estates’ residents and has said they would not be ready before 2019. 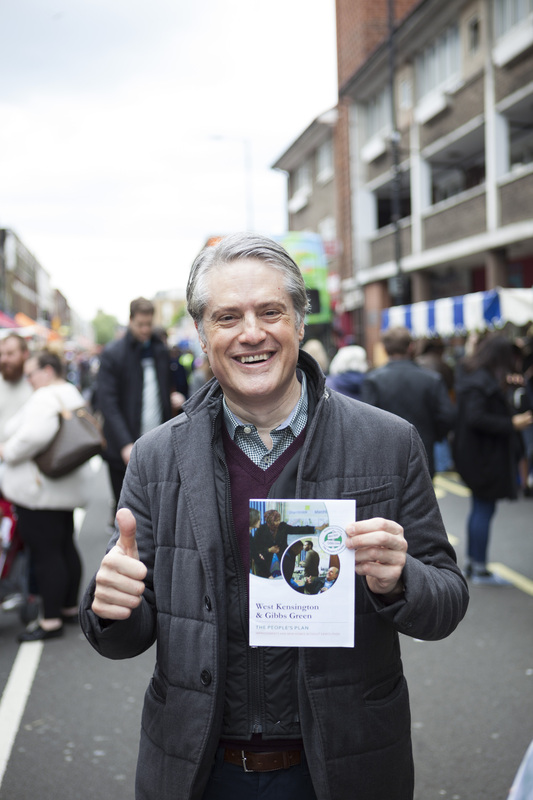 By contrast, our People’s Plan to make improvements and build additional homes without demolition is far more realistic, could be delivered within five years of obtaining the necessary permissions, and is supported by many residents who have directly engaged with its creation. Watch this space for details of our plan, which we shall publish soon. 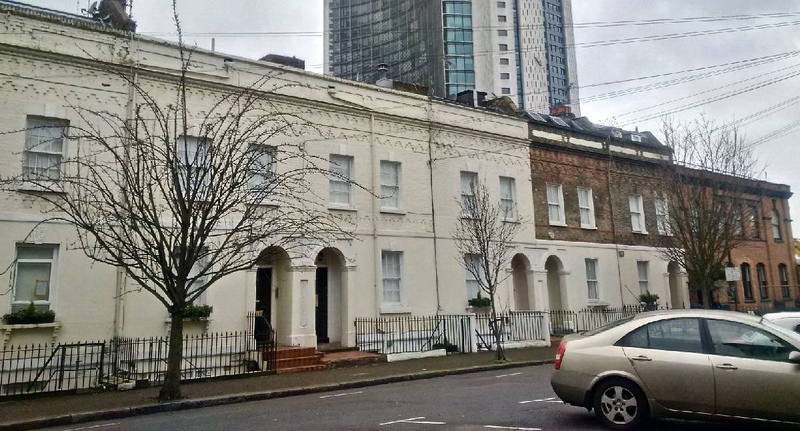 On Friday 22nd April at 8.30am, Capco’s Group Director of Development Management, Mike Hood, failed to turn up to his own ‘breakfast roundtable’ at the Earls Court Project Rooms in Empress Place, having previously put out an invitation saying he wished to “listen to the wisdom of the community”. 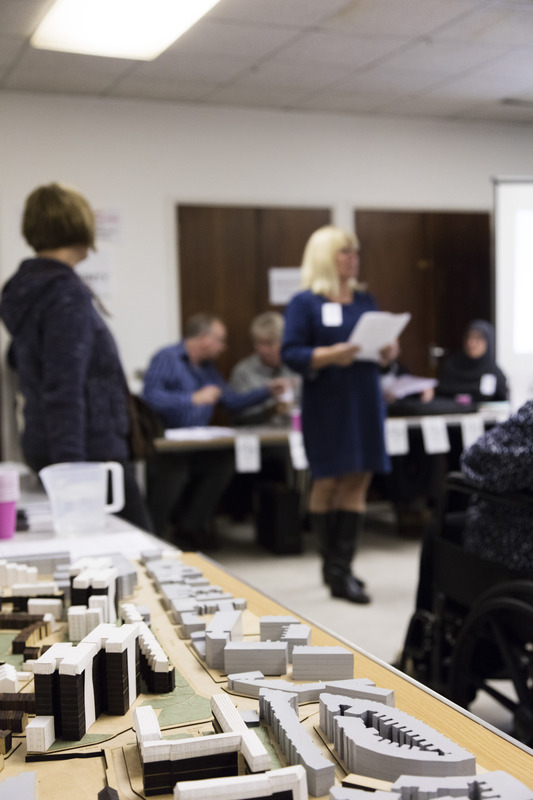 Residents had produced a briefing document for attendees to remind them of the 500 responses to Hammersmith and Fulham Council’s consultation on Capco’s plans in 2012, at which 80% of respondents were opposed to demolition. 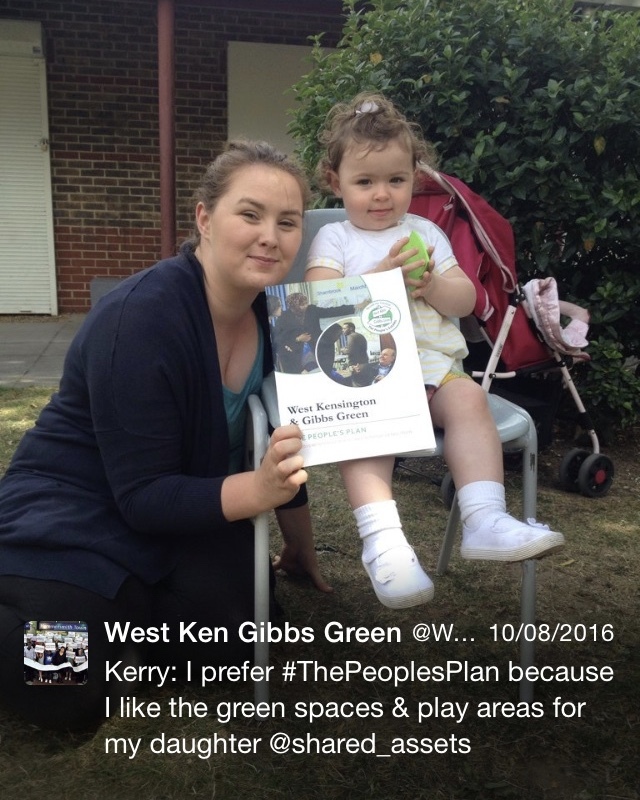 Consultation responses came from residents of all ages up to 92 and ranged from children saying ‘Your promises are just a trick’ to parents saying ‘I am worried about harm to the elderly’ and ‘My only dream is to keep my home’. The full set of responses can be read below. 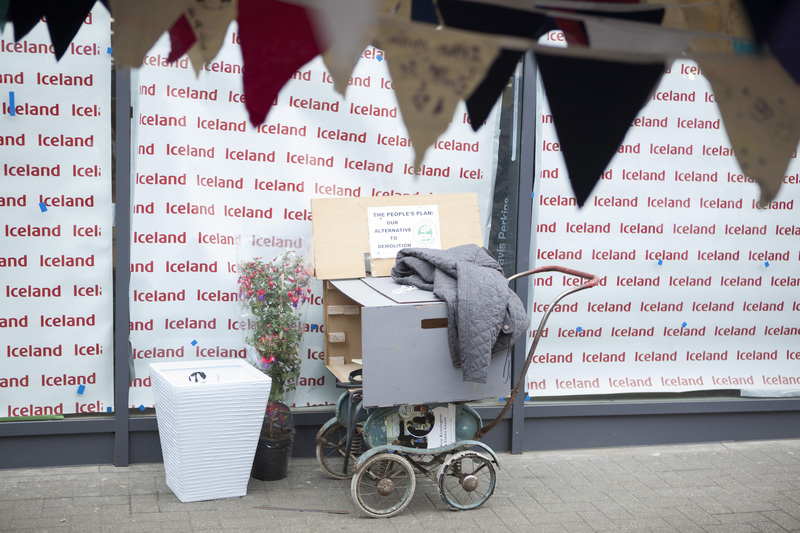 When David and Donna Isaac – who face the possibility of being moved out of the area completely if their home is demolished – made enquiries inside, they were told that the event had been cancelled. The residents’ own breakfast did proceed as planned, however, with blueberry muffins, local wisdom and fliers shared amongst themselves and with passing commuters, who were most appalled to hear of Capco’s plans to ignore the wishes of the majority on the West Kensington and Gibbs Green estates. 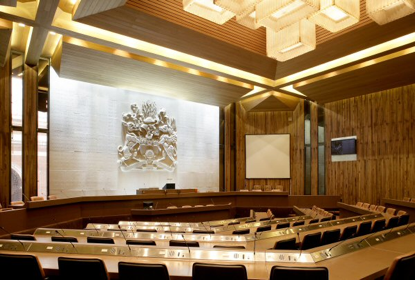 These extracts are from residents’ responses to the Council’s formal consultation in 2012. 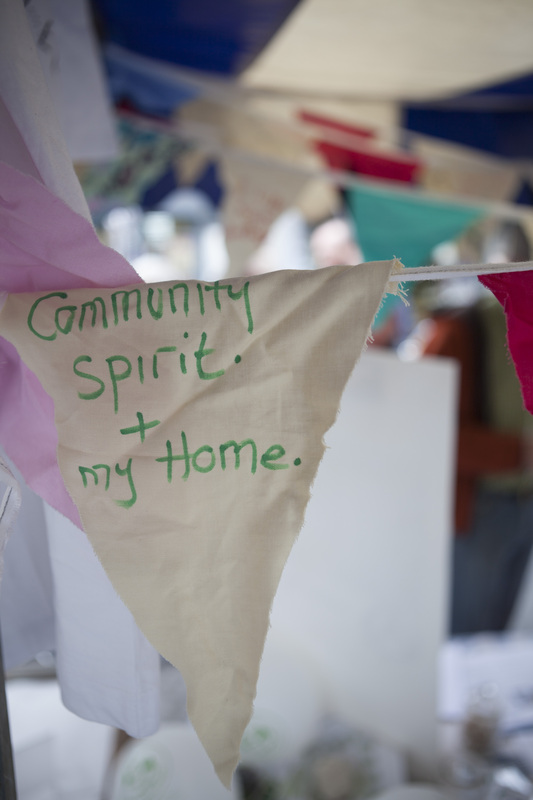 Five hundred voices answer “What makes a community flourish?” and share their fears, if developers take their homes. I like my house. People might get angry. I am 6. I love my estates. I am very worried. I play in the playground. No. No! Knock down your own home! You are a big bully. Please don’t knock down our homes! My friends walk me to school. What about people? Demolish other places! So, don’t sell our homes. That is rude. It makes me sad and angry. To the Governor. You are being cruel. We don’t want to move. Don’t demolish my home! Don’t raze our homes! I am worried about this. Keep your hands off! Your promises are just a trick. It is hidden agenda. Please don’t do this to us. I feel very scared. Demolition game, rubble trouble. I’m very unhappy and upset. Don’t contact me! Respect the wishes of majority! I hope my words…. The estate is not noisy or messy. I know my way around. I’d be very depressed. No David! Our Society! Make more money with buildings. You are making us homeless. Memories thrown away. My friends all live here. This is pathetic! You can’t make me move. Blackmail, insulting. Emotional, social and ethical scandal…. Very shocking. May not be accommodating. You can shove your promises! Don’t tear down our neighbourhood! Children-teenagers point of view. Don’t take away freedom of speech! Very out of order. Great sense of loss. Council spoon-feeding residents. It is a selfish act. Kicked out. Not going anywhere! Of course I’m concerned. Major negative effect. Should focus on kids’ future. I will talk to my neighbours. Very selfish indeed. I dread the idea. Accept what the people want! I will miss my friends. Keep out from our estates! Why would you do that? The Council has no democracy. Going to be full of strangers. Rich people will be moved in. I am very concerned. No, no, please. Don’t demolish! Association to fight. Don’t demolish decent homes! Quite disorganized. It makes me personally unhappy. I’m not happy. The Council is sly. Somewhat greedy. You don’t ##ing care about us. Bog off! Very devastated. They suddenly want to knock down. Some kids…. Huge repercussions on young people. Intent to destroy. I’ve grown up here. Please don’t! Snakes. Scheme is rubbish. Don’t sell to the fat cat! Not reasonable. I will have a tough fight with you. I won’t stand for it. Government should not allow it. I’m not going to let this happen. It will disrupt my life. You won’t have much luck. Keep our homes! One of the reasons…. Waste of time and money. Cancel the scheme! I don’t believe the assurances. Demolition machines. Your assurance is a hollow one. Their offer, we don’t need it. It’s not for the people around here. It’s a strong and safe community. They’re just pushing us aside. Take our passion seriously! Dunkirk beaches. I feel saddened. We shouldn’t be thrown out! Ballots would be democratic. I refuse to move! It’s stupid. Piece of s###! They don’t give a f###! No one listens! It’s a bad idea! Start all over again. Stubbornness to stay put. It made me cry. WKGGCH should have ownership. Agree! I have two babies. Council totally and utterly wrong. Council refuses to help. They can’t rule over the people. I love my community. You must listen! Don’t demolish! I will not move. Elderly and disabled don’t deserve it. It’s horrible. No offer to me. Everyone looks out for each other. Detriment to the wider area. Wrong to be knocked down. False promises. No one asked me. It’s bull s###. Too bad. Lead to overcrowding. One way conversation. I don’t want the money. No promise for me. My brother is disabled. Very disruptive. Classist proposal. Epilepsy. Try listening to us! I’m happy with my home. Regardless of anyone’s views. I will stand firm. You don’t have residents’ interests at heart. It’s too risky to accept. The human cost must be considered. I won’t let it happen. Worst manner. I almost fainted. It is not fair. It’s disgusting. Refused this plan from A-Z. Treating us like animals. All lies. No choice except to fight. Very unstable for me. Not properly informed. Unrest from all tenants. Out. Out the developer! The future scares me. Community should take over. Too much inconvenience. Promises are not genuine. I f###ing don’t want your promises. The demolition is unnecessary. They don’t want to know. They shouldn’t shut us down. The scheme is crap. I love my neighbours. Cause us great distress. No focus on the people. Tell us the truth! I feel very bad. Discrimination against lower income people. I don’t want the community destroyed. My home is beautiful. I will fight this demolition all the way to the end. We will be homeless. It’s going to upset the children. Plans need to be honest. I will be made homeless with my child. Just out for themselves. Of course I don’t want this to happen. The developer’s hidden agenda. Demolition is not right. So much extra cost. I’m being conned and blackmailed. Not shown me any respect. Our voices must be heard! My children like the place. Negative on the community. Please don’t! I will be hugely disadvantaged. Enough to cause stress. Take care of her. We should be able to vote. People help each other. I am flabbergasted. Don’t destroy our homes! Don’t sell to developer! Awful thing to do. I have spent a lot of money. I love my home. Stop bullying me! Neighbours help with new born baby. Hands off the community! I don’t want to be demolished. Misleading information from the Council. Treated us stupidly. You’ve secret agreement. I came here to be safe. £££ signs. My family: nowhere else to go. I feel very stressed. The future is dark for me. Scheme is not beneficial to residents. You disregarded us. WKGGCH is the way forward. You must be heartless. We are being exploited. Fiercely opposed. They don’t want to communicate. Devastating for the neighbourhood. Bad idea to move the people. There is no reason to knock down. Development would destroy jobs. Should be illegal. I am against. Development will destroy the environment. It’s not just. I will feel bad. The way the Council talk is upsetting. Development is bad. I am psychologically attached… Let us get on with our lives! Oh My God! I want WKGGCH to take responsibility. Can’t imagine the mess! My preference is for the estates to be transferred. Feel angry and crap. I would shed a tear. Makes me sick. We are being pushed aside. I want the right. Sense of community. Load of tosh! You are very wrong. You lied to me. Let us run our estate! My home is my kingdom. My neighbours my family. No way! You do not deliver. Stop telling lies! Five children, better off in this house. Not been translated. Get out please! Money only to the developer. Calling where we live slums? Diabolical. Making money out of people’s vulnerability. Very bad thing. You didn’t tell me. Adding stress. This will devalue my property. Don’t destroy! Don’t sell! F### you! I don’t believe the Council. Keep Out! I see no reason for destroying. I will never leave this home. Leave me alone! Poor to be squashed. Will affect my well-being. The developer wants to throw us out. We did work hard. I have done a lot of planting. It is a shame to be brought down. I am worried about harm to elderly. Don’t trust the Council one bit. 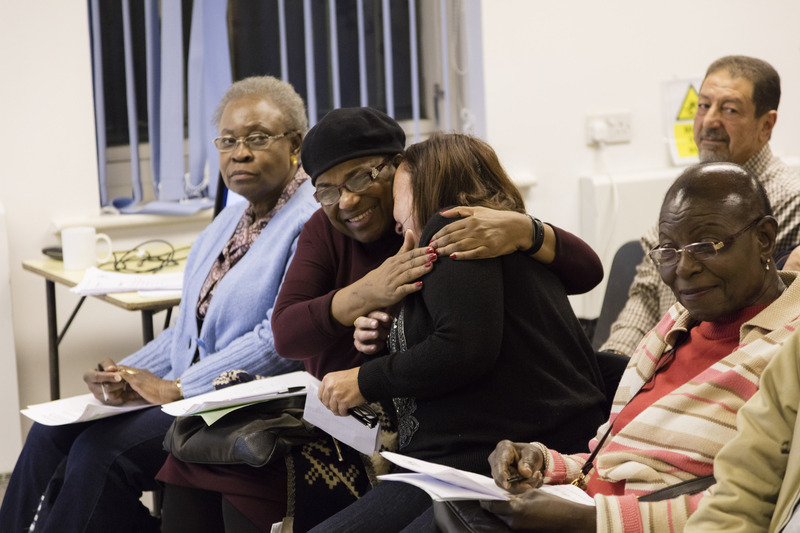 Residents’ emotional attachment to the community… Last thing I want. Our future, our lives, our homes. Both my children have disability. I will be scared. Stop lying! Confusing and unclear. You are stopping me. I will chain myself to the doors. So very angry. Please respect the people. Put poor people in bushes. For them to say…. I love my home. I object very strongly. I’ll watch you fail. Give us the vote! This is my neighbourhood. I am settled here. Listening to its pockets. You just don’t care. My only dream is to keep my home. Very condescending. Really annoying me. Seems a waste. What happened to the Conservatives’ Big Community? Please listen. Already own my own white goods. Thrown away. Very worrying. Your assurances are a sham. Kicking us around like a football. I am not impressed. Neighbourhood means everything. We should be self-governing. Allow residents to vote! They’ll disregard the estates. I fight to the end to keep my home. What about us? The Council is trying to bribe people. The developer is not legally bound. Disposition of working class citizens. I am against demolition. There is nothing wrong with the estates. I like so much my home. You are trying to frighten people. Stop you monsters! I wanted stability for my family. Seven children, nowhere else to go. Council put a sum on happiness. I don’t enjoy best of health. I don’t trust the Council. It will affect my family. You are irritating. I object. The Prime Minister… Views are disturbing. For rich people, not for poor. Our beloved estates. Cancelled! You shouldn’t sell our homes! Your communication is below zero. There needs to be social housing. Put the residents ahead! Elderly can’t defend themselves. I can’t understand. It would hurt me. I am on the side of the people. I don’t want the Council to get rid of me. The new development is not what I want. I am happy to stay put. The proposal to demolish is very unfair. Neighbours are very helpful. We have invested time and money. What do we get? Asthmatic building site. Community housing a brilliant idea. Good community spirit. We look out for one another like a family. Stay out! To be stuffed some other place. This is a great neighbourhood. I want to see tenant ownership. I feel completely rejected. You say one thing…. Adversely affect residents. Get out of my house! How dare you! Money is nothing. Security and belonging. I have set roots down. I don’t think they take my opinion…. Disabled adaptations. Blocking off my choices. I feel betrayed. Need a bulldozer to take me out. This is my final decision. Get stuffed! I’ll sleep in the kitchen. They talk utter rubbish. We don’t want to be homeless. The promises don’t make sense. Council is on one-track mission. Against my wishes. It makes me feel violated. Treated as an idiot. Social cleansing. Uprooting destabilizes family and neighbourhood. Fat cats! Plans are unnecessary. Like pie-crust: easily broken. Unbelievable! Toe the Leader’s line. Affected negatively. Nervous breakdown. People call and cook for me. You cannot put a price on the home. Don’t darken my doorstep! Fed up to the teeth. It is not polite. I feel uninformed and herded. You cannot put a value on the home. My psychological well-being. You are robbing us. Very, very angry. The Court will bring justification. They don’t know who I am. Tory canvassing for Boris Johnson. Council is just being greedy. I’ll march tomorrow to stop you. We should have full freedom! I’m lost. Get together and fight this decision. The community should take over. Good community spirit. Making us feel sad. Disabled and need to stay. My neighbours are good friends. Force us into hutches. Jargon hides their lies. I’ve experienced dictatorship. Council! Stop that! A very important argument…. I am disabled after a brain tumour. Put to Outer Mongolia if lucky. Cannot replace what I have got. I must not move. Load of rubbish. All about greed. Full of s##t. I am appalled and upset. You make me feel terrible. The Council is running down the estate. I have a right to be heard. Sell to a company saddled with debt. Stop and think! Leave us alone! You only want to build private homes. The Council are mean. 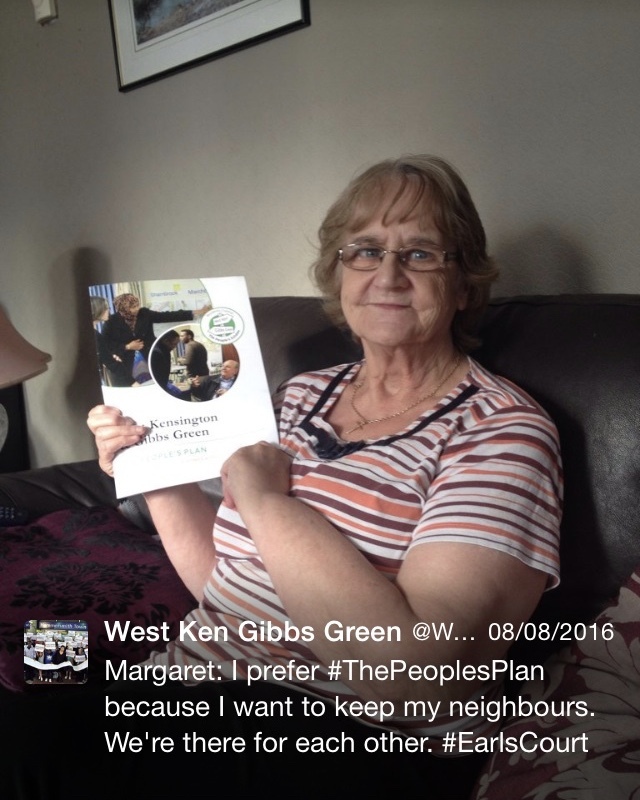 Greenhalgh wants social cleansing. I’m not a gambling man. Stress might finish me off. Not conducive to well-being. I don’t want a flat. I want to stay here. Greenhalgh stood in my house. Made me feel worried. Fight for the estate! It hurts me. Keep protesting! It would be criminal to demolish. Let the people decide! No Sir! Stop ignoring us! It belongs to the people. No water or heating bills. Improved immensely under Decent Homes. Council try to cheat me. The Council does not listen to the tenants. Your mercenary intentions. This is causing a lot of stress. High class people will benefit. Many people will go homeless. I am very depressed and angry. You’re playing around with people’s minds. It’s all one way. I am disabled. This house suits my needs. Council is utterly wrong. I want my vote. Scheme’s promoters – self-aggrandizement. You want to throw us out. She doesn’t want the upheaval. This is bad. You are just trying to fool us. Do not sell my home! I’ve had enough. Put everyone in a ghetto. Council treat people like idiots. Proposal would harm community. I won’t let you kill my mother. Scheme is crackpot. Like most of my neighbours…. Who are they to say? I am old and blind. You are wrecking my nerves. It would be awful to demolish. No way! It makes me bloody angry. I am a doctor serving humanity. Do not pack my things! It’s mysterious. The Council are cheating us. We oppose with efforts of unity. I belong here. I don’t want to move. Not good enough. Council neglecting their responsibilities. Upsetting me. The buildings are structurally sound. I will go to the Queen. One of the stupidest things. My Gosh! My Gosh! You will have to drag me out. In my mind and being… It is a bit scary. Home. Bullying tactics to bulldoze. It’s a crime. Harm the local people. Café members strongly object. We cherish this estate. Lump you in your head. Don’t dictate! Cannot put a price on community spirit. Explain. I feel for the people. Bring rich people in to serve you! Council has declared war. Talk to TRA. Battery hen environment. I do strongly object. Cause stress and hardship.